BEACON FALLS — Kayaks, canoes and rubber ducks are getting ready to share the Naugatuck River again during the annual River Fest. The festival will take place May 3. 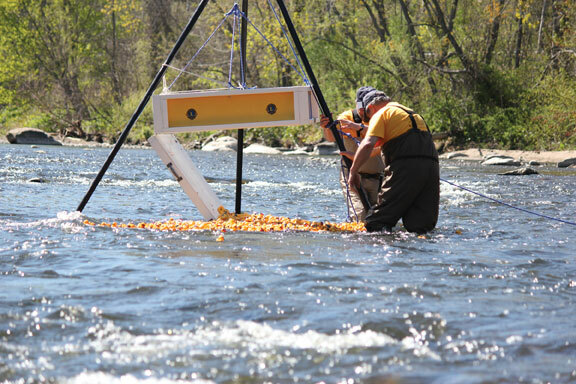 The event combines the 16th annual Beacon Falls Lions Club’s Duck Festival and the 7th annual Naugatuck Valley River Race. From noon to 5 p.m. festive activities, including food, crafts, vendors and live music by the Naugatuck-based Rubber City Blues Band, will be taking place at Volunteer Park behind the firehouse on North Main Street. “We have about 30 crafters, from jewelry to hand bags to custom made items. There will be great beer on tap, nice food from local vendors and the fire department, and goods and services auction going on as well,” Beacon Falls Lions Club member Bill Mis said. 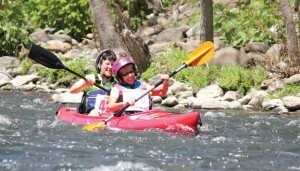 Kayakers and canoers are in for a good trip down the Naugatuck River, according to Dave Faber, owner of the Oakville-based CT Outdoors and organizer of the race. Last year the lack of precipitation before the race led to low water levels in the river. Faber said the race will be fun for those who want to watch as well as those paddling. Spectators can cheer on racers at the bridge near the Polish American Club, Lynden Park, Maple Street Bridge in Naugatuck and Volunteer Park in Beacon Falls. The registration fee for the race is $25 plus $10 if an official race shirt is requested. Registration will be held from 9 to 10:30 a.m. at Platts Mills Road in Naugatuck. The race begins at 11:30 a.m. Registration forms for the race can be found online at www.bfpharmacy.com and www.4ctoutdoors.com. The course is 6 miles ending at the Depot Street Bridge in Beacon Falls where racers can then head over to the festival. Later in the afternoon, the Lions Club’s annual duck race will be held. Tickets are $5 each. Then all the rubber ducks are collected and dumped into the river to race. Duck race tickets can be bought at Beacon Falls Pharmacy, 20 North Main St., New Harvest Restaurant, 57 South Main St., or from Lions Club members. First place prize this year is $1,000 and second place wins a 14-foot Wilderness Systems Kayak. The ducks that come in third to seventh place will win a $100 gift certificate from local businesses for their owners. Robert Bradley, owner of Beacon Falls Pharmacy and one of the coordinators of the event, said the annual festival shows how important the river is to people. “It highlights the fact the river is nice and clean and people can enjoy using it,” Bradley said. This wasn’t always the case, however, as the river used to be polluted. “I’ve lived in Beacon Falls my whole life. Our mothers didn’t have to tell us not to play in the river,” Bradley said. While the event is about people having fun and celebrating the river, for Mis it’s also about raising money for the Lions Club to help support local charities. “All the money we raise we give away. We give out $8,000 in scholarships to local high school seniors. We need to raise money to do that,” Mis said. The money raised from the river race will also go towards a charitable organization. Faber said all the proceeds from the race go towards organizations that promote the river and paddler safety. “It is a real good time, with a lot of great vendors, great food and a kayak race. It’s a real nice way to spend a Saturday in May,” Bradley said.